This delicious ragú is packed with flavour and is incredibly easy to make. 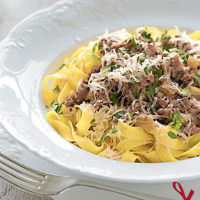 Veal makes a pleasant, lighter alternative to minced beef. Heat 1 tbsp oil in a large pan over a medium heat. Sauté the onion and celery, stirring occasionally, for 5 minutes or until softened. Spoon onto a plate and set aside. Return the pan to the heat and increase the temperature to high. When hot, add the remaining oil and warm through for a few seconds before adding the veal. Fry for 8-10 minutes, stirring very occasionally, until well browned. Return the onion and celery to the pan and stir in the flour. Add the wine, bay leaves, stock and 250ml boiling water. Bring to the boil, reduce the heat and leave to simmer for about 1 hour, uncovered, or until reduced slightly, adding a splash of extra boiling water if the mixture starts to look dry. Remove the bay leaves. Season to taste. Serve with hot Waitrose Saffron Tagliatelle pasta and a generous amount of finely chopped fresh flat leaf parsley and grated Parmigiano Reggiano cheese. This freezes really well, so it’s worth making a double batch and freezing in portions. Defrost thoroughly in the fridge and remove the bay leaves before reheating. Place in a pan over a medium heat and cook, stirring occasionally, for at least 10 minutes and until piping hot throughout.